We are an industrial supply company and MRO supply distributor serving the manufacturing (MFG) supply needs of OEM manufacturers and job shops in PA, New Jersey, Maryland and Delaware. Looking for precision cutting tools, die components, Mitutoya measuring devices or Norton Abrasive products? We manage the industrial supply catalogs for over 50 different brands. Your one stop shop for all your manufacturing supplies. Looking for a special silicon carbide sharpening stone that you must have in your tool room or the SGS end mills you prefer for roughing? We sell Danly die sets, iFab die sets, press brake tooling, indexable micro tools, abrasive products, metal working fluids and anything else your plant may need to keep your machines humming. 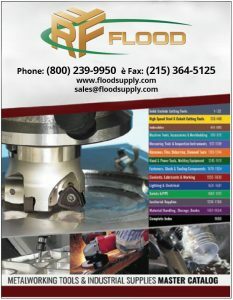 Here at Flood Supply, we are an industry-leading supplier of precision industrial products including: abrasives, cutting tools, die components, fasteners, tooling and shop supplies. We have established a reputation for superior products and services to help you tool your future through high performance tools and unmatched customer satisfaction. Interested in our catalog? Click the image for a pdf or email us your address and we will send one to you.